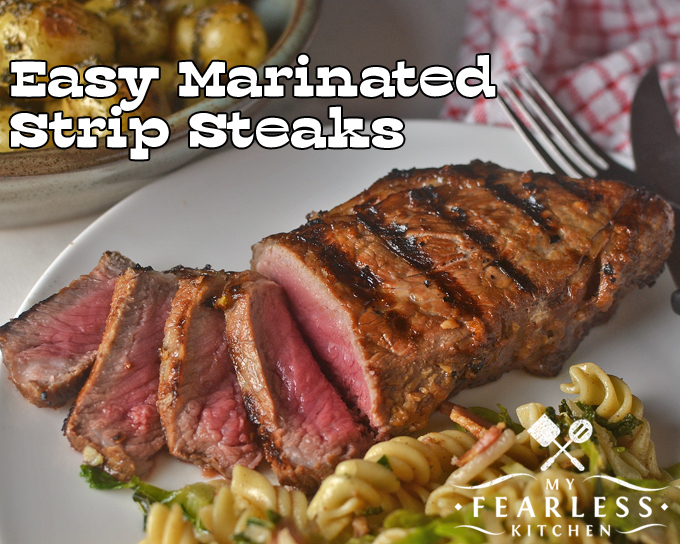 These Easy Marinated Strip Steaks are perfect for the grill – whether you’re grilling for a holiday celebration or just a weeknight family dinner. I don’t really care what time of year it is, I’m always looking for a good excuse to use my grill! And a delicious steak is always a good excuse for the grill! Strip steaks are also called New York Strip Steaks, Manhattan Steaks, or Kansas City Steaks. Can’t find strip steaks? 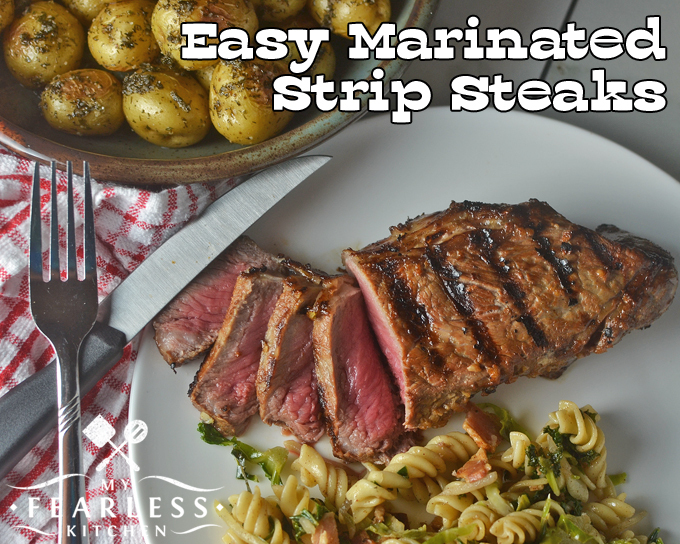 You can use this marinade with any other steak you can find! The great thing about grilling steaks – especially if you are cooking them to medium-rare – is that they take practically no time to cook! When you’re grilling over 500 degree heat, beef cooks in a hurry! In fact, you can preheat the oven, toss in these potatoes for a side dish, then turn on the grill and cook your steaks, and the potatoes and steaks will be done right about the same time! The marinade for these steaks couldn’t be easier. Toss 4 ingredients into a bowl (and 1 of those ingredients is water! ), mix them up, and pour over the steak. I used fresh garlic, minced with a garlic press, and the juice of a fresh lemon because I had some extra lemons. You can easily substitute jarred minced garlic and bottled lemon juice if that’s what you have on hand. Now, fire up those grills, and let’s cook some steaks! What’s the Best Meat to Grill? 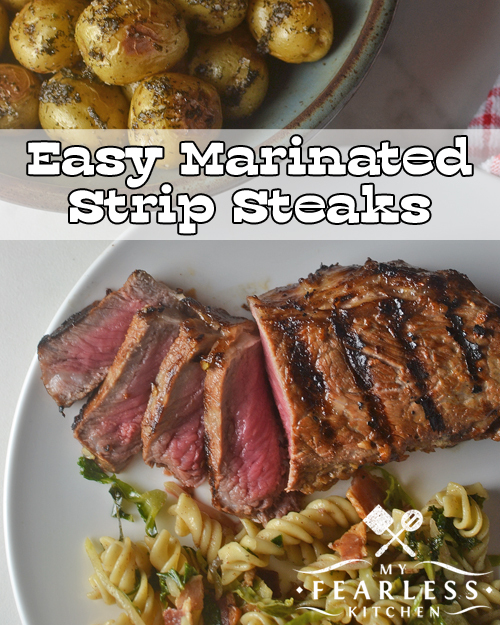 These Easy Marinated Strip Steaks are perfect for the grill - whether you're grilling for a holiday celebration or just a weeknight family dinner. Combine soy sauce, water, garlic, and lemon juice in a small bowl. Stir to combine. Place steaks in a gallon-size Ziploc bag. Pour marinade over steaks in the bag. Seal bag, pressing as much air out as possible. Place the bag of steaks in a tray, and refrigerate for 2 hours (or overnight). Remove steaks from refrigerator approximately 30 minutes before grilling. Place steaks on the grill. Let steaks rest, loosely covered with aluminum foil, for 3-5 minutes before serving. I think I can do this! So much better than the premade marinades! Thank you for the fresh ideas at Celebrate 365 Blog Party! We are so glad you came over!